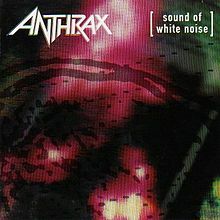 Sound of White Noise is the sixth studio album by Anthrax, released in May 1993 on Elektra Records. It is the band's first album to feature vocalist John Bush, who replaced longtime Anthrax vocalist Joey Belladonna in 1992. It is also Anthrax's last studio album with longtime lead guitarist Dan Spitz. Used CD In Excellent Condition.